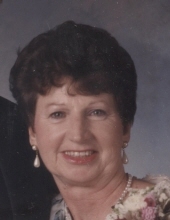 Wilma “Jean” (nee’ Roark) Marshall, age 83, passed away January 19, 2019. She was the beloved wife of the late Billy Ray Marshall, cherished mom of Greg (Leanne) Marshall & Jeff (Melissa) Marshall, proud grandma of Cameron and Tyler Marshall, and dear sister of Pauline (the late Roy) Cannon. Jean was preceded in death by her parents, Kelley and Ilda Roark, two sisters, Lois and Nieve, a brother, Provie, and her step-dad, Astor. Funeral Services will be held at Craver Riggs Funeral Home and Crematory, 529 Main St., Milford, OH 45150, on Thursday, January 24, 2019 at 12 NOON, where family and friends will be received from 10:30 AM until the hour of service. If desired, family suggests memorial contributions be directed to The Mary Jo Cropper Breast Center, via Bethesda North Hospital, 10500 Montgomery Rd., Cincinnati, OH 45242 or to The American Stroke Foundation at www.americanstroke.org/donate. "Email Address" would like to share the life celebration of Wilma Jean Marshall. Click on the "link" to go to share a favorite memory or leave a condolence message for the family.